Würth Elektronik has qualified another prepreg that fills the gap in the layer spacing between prepreg 1080 and prepreg 2116. With the prepreg 2113 (thickness of about 92 µm), there are now new options for designing the track widths of impedance-adjusted PCBs. 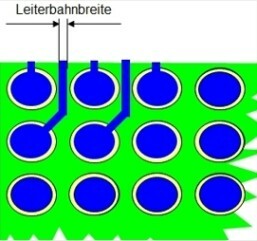 Microstrip structures on the outer layers with a ground plane on the first inner layer is a very frequently used variant for impedance-adjusted PCBs, both with and without microvias. To date, the thin 1080 prepreg (around 68 µm) and the 2116 prepreg (around 108 µm) were available for this dielectric separation . Neither are the best when it comes to meeting all of the most common impedance requirements. The 2116 is ideal for differential impedances, but a track width of 165 µm for the single impedance is problematic in many designs with high packing density. The 2113 prepreg with its thickness of around 92 µm is exactly between the two other types, eliminating these disadvantages. The 2113 is new to many in Europe, but is often used in Asia. The 2113 prepreg has been available from Würth Elektronik for a short time. As sophisticated PCBs are becoming increasingly made with a low CTE material for reliability reasons, mainly to keep the Z-axis expansion low , only this type of material is used for the 2113, a filled, halogen-free material with a Tg of 150° C.
It is not recommended to use two 106 prepregs, each having a thickness of 50 µm.These prepregs are considerably more expensive than the other three, and owing to the high resin content, significantly larger thickness variations are to be expected which in turn has a negative effect on the impedances and complicates the microvia manufacturing process. The same applies for the use of a very resin-rich type 1080 prepreg with a thickness of around 80 µm instead of a 2113.